Problem : the maritime world is recognized for its know-how in the art of “rigging”, the guying of the riggings, allowing to elaborate impressive structures from simple cables and assembled spars. To be protected from bad weather is a major problem of the construction and naval repair. The difficulty is to be able to offer a service in compliance with expectations, even beyond the historic practices. Brought solution: it was necessary to develop solutions by shrouding cabling by associating them to heat-shrinkable film. This type of solution is light but complex. 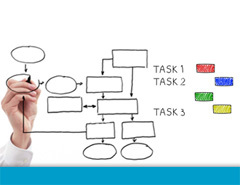 Overviews pre-sized by the calculation permitted to answer in a reliable way the most requiring specifications. 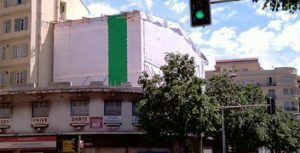 The problem: in the city centre of Nice, an old burned building with asbestos pollution must be demolished and evacuated to give up the place to a vast real estate program. The intra-urban situation of the site, a few meters away from the famous “Promenade des Anglais”, imposed a maximum of precautions. Brought solution: the building was completely covered by a built and covered structure. The demolition was realized in several phases by machines, entering within the structure of confined space. Problem: during big works of the Palace refitting, problems of waterproofness appeared on the top parts of the building during the worksite. The water streamed in numerous points of the lower level. The customer demand was to bring him under very short deadlines a long-lasting solution during the period of the works. 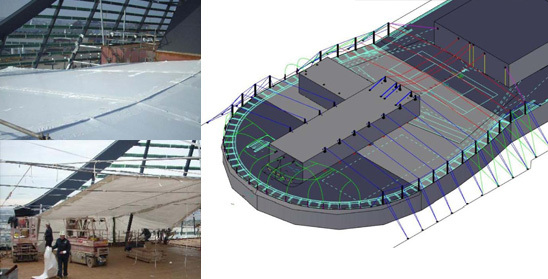 Brought solution: in close collaboration with the Client and the Project manager, it was necessary to set up a structure of PVC covers tightened cables allowing the evacuation of water towards the outside of the zone to protect. 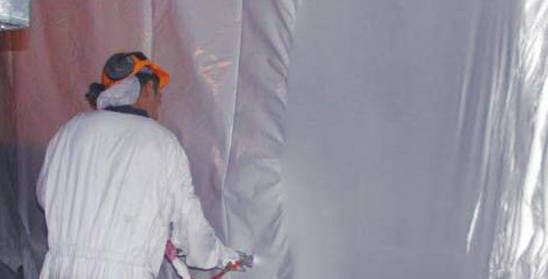 A hard technical point was the specific treatment of the very numerous bearing IPN pillars crossing the containment. The exposure of inlet of maritime air imposed a particular vigilance on the implementation. Problem: during fires, a recurring problem is the scattering of dusts during the fire and its extinction by the fire brigades services. In case of asbestos, the site can be completely contaminated after the disaster. 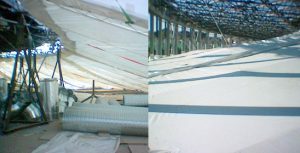 In the case of this gymnasium situated in town, it was necessary to confine the gymnasium to protect the immediate environment and allow the works of decontamination the best way. Brought solution: the main difficulty was that the zone was unaccessible because of the material fallen inside and of the omnipresence of dusts and materials with asbestos. It was necessary to implement a solution of light roofs and fixed to the sidewalls staying in position. On the basis of calculation notes of load on the anchoring, structures of filmed beams were assembled on the ground then raised and organized. The access was possible by lifting platforms positioned outside of the building. The problem: the inside of a reactor building (RB) is covered with a resin of very high-strength protection and that quality and efficiency are regularly controlled by the authorities of nuclear safety. During programmed shutdown, sandblasting and then resin coating can renew some portions of cover. The dust emitted during the coating preparation works must be perfectly controlled without any emission, except inside the confined spaces in the BR. Other peculiarity, in the dismantling of the confined spaces, imprisoned dusts must not be freed. Brought solution: the implementation of a thermoplastic confined space became suitable in order to seal the volume. In phase of dismantling, the built structure being beforehand deposited, the access to the envelope of confined space is not possible. 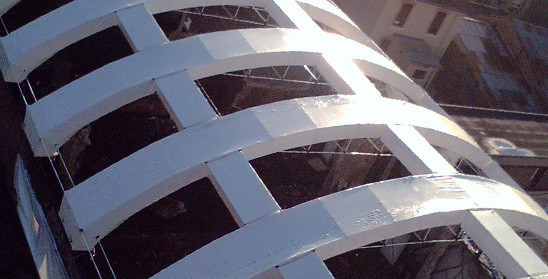 It was necessary to implement a procedure of progressive cut of the main face of the confined space of the upper level by vertical strips from the footbridge.